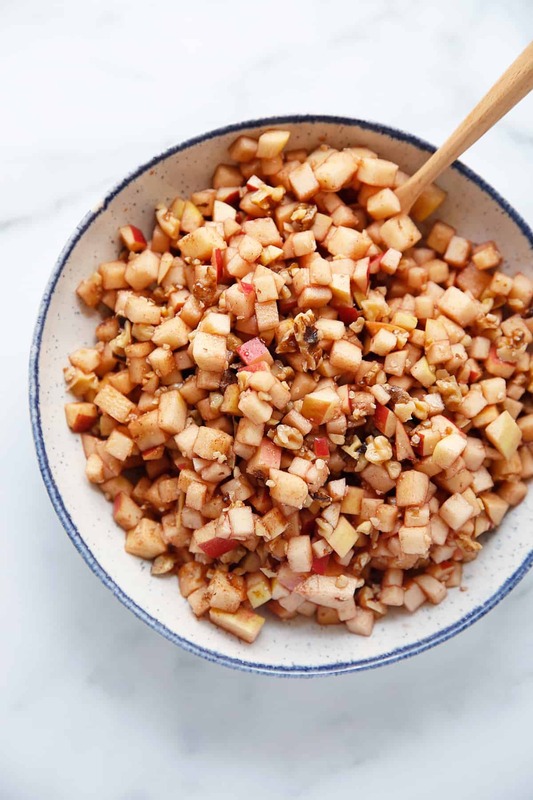 Charoset, also known as haroset, is a mixture of fruits and nuts eaten at the Passover Seder. 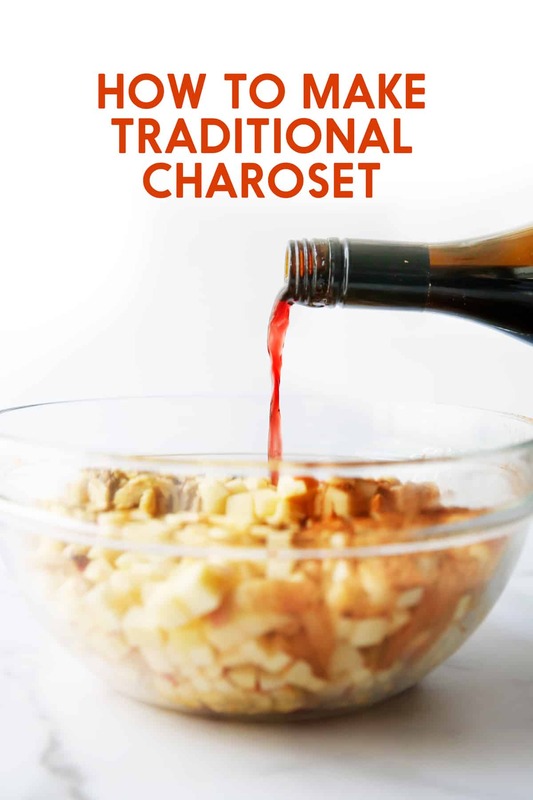 Traditional Charoset is easy to make, and it’s one of those fly-by-the-seat-of-your-pants recipes, as you adjust as you go! This traditional haroset recipe is naturally gluten-free of course, and is a yummy, sweet condiment. Growing up, haroset was a childhood staple at our holiday. We’d make a batch as a condiment of sorts for our Passover sedar plate, and end up eating it for days on Matzo (now gluten-free matzo), or just as a yummy side by the spoonful! Since we always ended up enjoying it for days, we always made a bigger batch! You can always scale this down of course. How long can you keep charoset? The charoset can be made up to 3 days before serving and can be stored, covered, in the refrigerator. We love making it early and letting it soak up all the added flavor. This also reduces the strong wine flavor that you’ll notice when you make it initially. You can use grape juice if you don’t want to use a sweet wine! Kedem was always the favorite growing up! Though, I haven’t checked those ingredients probably ever! In Israel the spelling and pronunciation is “charoset,” with a more guttural “ch” sound. The other pronunciation is a softer Ashkenazic “h” sound. In large bowl, stir together all ingredients. Store, covered, at room temperature until ready to serve. If making it early, store covered in the refrigerator. I like to make ours the day before and store in the refrigerator. You can toast the walnuts if desired, but I never do! 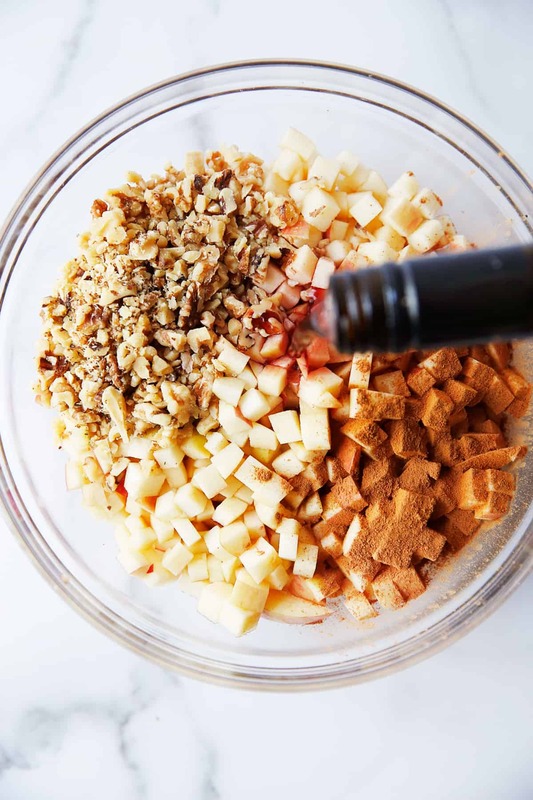 We don't recommend using a food processor to dice your apples, simply use a knife and cut them up small. Awesome recipe, will definitely try this one when I get home. I could eat Charoset year-round! I made this yesterday for Passover and it was awesome! Loved the addition of dates. We did not use any sugar/sweetener and it didn’t need it. My dad said this was the best charoset he’s ever had. Definitely will be making this again!